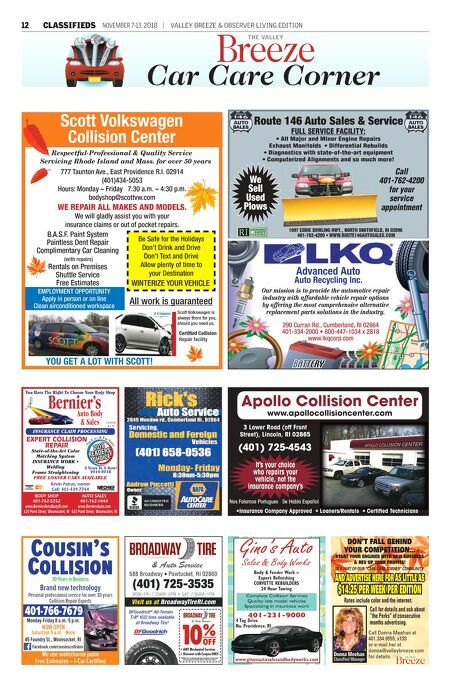 12 CLASSIFIEDS NOVEMBER 7-13, 2018 | VALLEY BREEZE & OBSERVER LIVING EDITION State-of-the-Art Color Matching System INSURANCE WORK • Welding Frame Straightening FREE LOANER CARS AVAILABLE You Have The Right To Choose Your Body Shop INSURANCE CLAIM PROCESSING EXPERT COLLISION REPAIR Kevin Patras, owner Cell: 401-439-7744 BODY SHOP 401-762-5252 AUTO SALES 401-762-1040 www.BerniersAutoBodyRI.com 620 Pond Street, Woonsocket, RI www.BerniersAuto.com 620 Pond Street, Woonsocket, RI License #135 Bernier's Auto Body & Sales T H E C A L L & T H E T I M E S 3 Years In A Row! 2016-2018 www.ginosautosalesandbodyworks.com 4 Tag Drive No. Providence, RI Body & Fender Work – Expert Refinishing CORVETTE REBUILDERS 24 Hour Towing Gino's Auto Sales & Body Works 401-231-9000 Complete Collision Services Quality late model vehicles Specializing in insurance work 1097 EDDIE DOWLING HWY., NORTH SMITHFIELD, RI 02896 401-762-4200 • WWW.ROUTE146AUTOSALES.COM Route 146 Auto Sales & Service Call 401-762-4200 for your service appointment We Sell Used Plows FULL SERVICE FACILITY: • All Major and Minor Engine Repairs Exhaust Manifolds • Differential Rebuilds • Diagnostics with state-of-the-art equipment • Computerized Alignments and so much more! 777 Taunton Ave., East Providence R.I. 02914 (401)434-5053 Hours: Monday – Friday 7:30 a.m. – 4:30 p.m. bodyshop@scottvw.com WE REPAIR ALL MAKES AND MODELS. We will gladly assist you with your insurance claims or out of pocket repairs. YOU GET A LOT WITH SCOTT! Scott Volkswagen Collision Center Respectful-Professional & Quality Service Servicing Rhode Island and Mass. for over 50 years Scott Volkswagen is always there for you, should you need us. Certified Collision Repair facility If it happens. All work is guaranteed B.A.S.F. Paint System Paintless Dent Repair Complimentary Car Cleaning (with repairs) Rentals on Premises Shuttle Service Free Estimates WINTERIZE YOUR VEHICLE Be Safe for the Holidays Don't Drink and Drive Don't Text and Drive Allow plenty of time to your Destination EMPLOYMENT OPPORTUNITY Apply in person or on line Clean airconditioned workspace Advanced Auto Auto Recycling Inc. 290 Curran Rd., Cumberland, RI 02864 401-334-2000 • 800-447-1034 x 2818 www.lkqcorp.com Our mission is to provide the automotive repair industry with affordable vehicle repair options by offering the most comprehensive alternative replacement parts solutions in the industry. Car Care Corner We use waterborne paint Free Estimates – I-Car Certified Cousin's Collision 401-766-7679 Facebook.com/cousinscollision 45 Foundry St., Woonsocket, RI Monday-Friday 8 a.m.-5 p.m. NOW OPEN Saturdays 9 a.m. - Noon Personal professional service for over 30 years Collision Repair Experts Brand new technology 30 Years in Business Apollo Collision Center www.apollocollisioncenter.com 3 Lower Road (off Front Street), Lincoln, RI 02865 (401) 725-4543 Nos Falamos Portugues Se Habla Español •Insurance Company Approved • Loaners/Rentals • Certified Technicians It's your choice who repairs your vehicle, not the insurance company's Call for details and ask about "the Perks" of consecutive months advertising. Call Donna Meehan at 401.334.9555, x133 or e-mail her at donna@valleybreeze.com for details. Donna Meehan Classified Manager DON'T FALL BEHIND YOUR COMPETITION… START YOUR ENGINES WITH NEW BUSINESS & REV UP YOUR PROFITS! 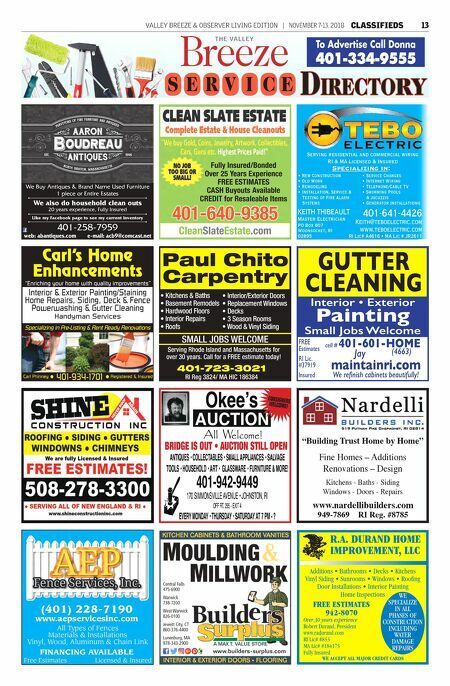 BE A PART OF OUR "CARE CARE CORNER" COMMUNITY AND ADVERTISE HERE FOR AS LITTLE AS $14.25 PER WEEK PER EDITION Rates include color and the internet.